Two weeks ago, Oxford Economics’ Technology Practice Lead Ed Cone, who oversaw the Workforce 2020 project, presented the findings of our research program at SuccessConnect. You can still catch his presentation–check it out here. 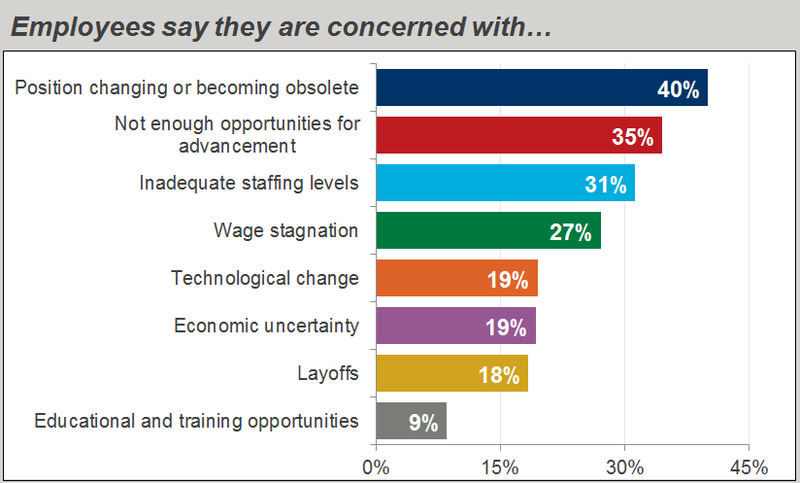 Executives and employees agree that leadership in their organizations is lacking. Executives cite a lack of adequate leadership as the number two impediment to achieving goals of building a workforce to meet future business objectives (behind lack of employee longevity and loyalty but ahead of lack of adequate technology). And only 35% say talent available in leadership positions is sufficient to drive global growth—a big problem in a workforce that is increasingly diverse. And while executives are worried about their leadership capabilities, they aren’t doing what it takes to cultivate leadership in their companies. Just 43% say that when a senior person leaves, they tend to fill the role from within the organization, and even fewer say they plan for succession and continuity in key roles. Even worse, just 19% of employees say that leadership is among the most important attributes bosses are looking for in their employees. None of these findings point to a rosy picture for the future workforce. That’s unfortunate, because to thrive in the global economy companies will need to develop leadership in their companies by supporting employees, encouraging workers to learn new skills, and planning for succession. When we surveyed over 2,700 executives around the world, we found that 83% are increasingly using consultants, intermittent employees, or contingent workers. The shift from hiring traditional full-time employees to a more flexible workforce demands major changes to the way companies think about compensation and benefits, training, and organizational culture. Companies are already responding to the changing workforce, but given the magnitude of this trend and the increased regulatory scrutiny that is likely to follow, they may not be doing enough. You can find more on the changing nature of work in our research report. If you haven’t checked out our research yet, you can find out more by visiting our landing page. Employees’ number one concern? Obsolescence. When we asked our employee respondents what concerned them most about their job, fully 40% said their top concern was their position changing or becoming obsolete—far more than the number who answered economic uncertainty or layoffs. 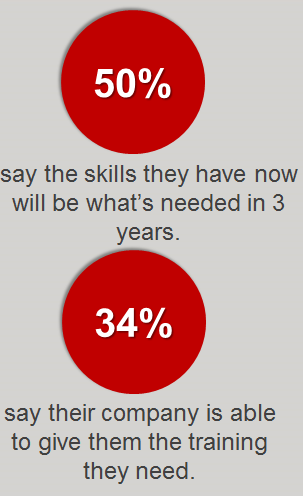 What’s more, employees don’t feel confident that they are developing the skills that will be needed in years to come, and very few say their company is helping. 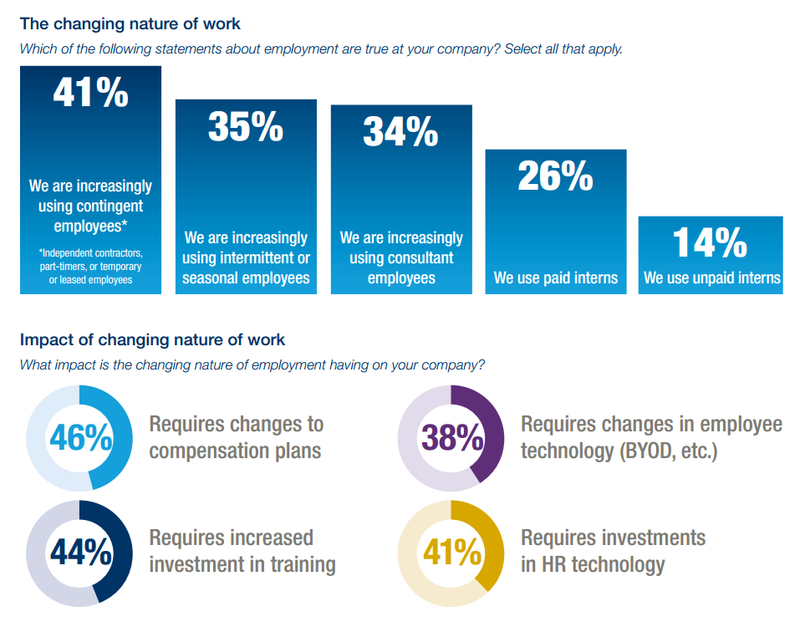 These findings caught the eye of Josh Bersin, founder and Principal of Bersin by Deloitte, Deloitte Consulting LLP. You can see his post, which expands on the problem of skills obsolescence and offers some recommendations to employees looking to reinvent themesleves, on LinkedIn. Among his tips? Take the initiative to develop your skills, whether through reading, going to conferences, talking with experts, and watching online videos. While being in charge of our own development may not be ideal for some employees, it may be one of the only ways to ensure continuous learning and development.